The Hockey Show sees Teebz flying solo tonight as Beans is off conducting business! With Teebz being all alone, he'll welcome in a guest he's been trying to get on the show all summer as there have been exciting changes in this woman's life! It's always fun to talk to people who have first-hand perspectives and experience with high-level hockey. This woman has not only covered hockey for her local university newspaper, but she plays it, she managed it, and she's done every job in between for a number of teams. To say we're getting a great guest tonight is only scratching the surface of this woman's overall persona! The Hockey Show is proud, honoured, privileged, and humbled to welcome former CWHL Boston Blades GM and current Director of Women's Hockey Operations at the NCAA's Colgate University Krista Patronick! 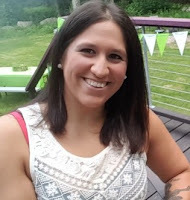 Krista's life is beyond interesting, and as I dug into everything she's seen and done I was amazed at everything she has accomplished before the age of thirty! Tonight, we'll talk to her about her time with the CWHL's Boston Blades, her transition into NCAA hockey life with Colgate, her work with The Hockey Academy and the multitude of jobs she did there, her life off the ice with husband Anthony, her love of the Boston Bruins, and an experience of which I'm sure she'll never forget being a part! To say I'm excited to have Krista on the show tonight may be the understatement of the year! So now you might be asking can you listen to the show, right? We suggest that you download the UMFM app on your phone or tablet. It's the easiest and most convenient way to listen to any of UMFM's great shows any time of the day, so go get it! Just follow this link on your iDevice or this link for your Android device and get the UMFM app! It's never been easier to tune into The Hockey Show or UMFM! Download the UMFM app today, and don't miss any of our great programming or shows! Tonight, Teebz welcomes hockey and fitness guru Krista Patronick to the show where we'll talk CWHL, NCAA, NHL, Umass-Lowell, and more only on The Hockey Show found on 101.5 UMFM and on the UMFM app! I love seeing the other potential logos that were created for teams. The above Atlanta Thrashers concepts were posted on Twitter today by Jen who goes by the handle @NHLhistorygirl. If you're not following her, you're missing out on some incredible stuff she posts. Honestly, she's one of my favorite follows on the medium due to all the great historical stuff she finds like the image above. These prototype logos for the Thrashers have some good and not-so-good thrown together, but I'd love to know who designed the logo in the top-right corner. That should have been an alternate logo used on the Zephyr hats! I would have bought one of those with the Thrasher-on-steroids shield logo for sure! While a little too cartoonish for my liking as an NHL logo, it would have worked perfectly as an alternate logo on ball caps and t-shirts. I don't believe the logo in the top-left corner would have made it to the final cut for me. It doesn't have that pop that one needs as a logo, and it looks like a high school hockey team's logo. Middle-left isn't bad, and it certainly would have received some consideration. Bottom-right is nearly identical to the actual logo used by the Thrashers, so it would have been discarded. Bottom-right looks less like a thrasher and more like a heron, so it would have been eliminated early on. The intense anger of middle-right gives it some credibility, but I feel that would have been a great secondary logo on the shoulder of a jersey. Really, in looking at these potential logos, the one in the middle seems to work best for an NHL team. Do you agree? Which of the rejected logos is the best one in your view? Post in the comments below! Thanks to Jen for bringing this to light! This is another one of those non-hockey entries I've been promising to do, so if you're looking for hockey today's not your day on HBIC. Instead, I found myself questioning what to do with a rather prodigious cucumber plant this summer that continues to produce cucumbers of varying shapes and sizes. In total, I have plucked a dozen of cucumbers off the plant in my garden, and my last inspection says there are mostly likely going to be another dozen before all is said and done on this growing season. As much as I like cucumbers, I'm not going to paint myself into a corner by eating a cucumber with every meal, so I needed to figure out how to use these cukes in a more sensible way. Having watched my mom make pickles out of garden cucumbers, I wasn't all that excited to do the sanitizing of jars and preparation of the cucumbers for pickling. It always looked like a ton of work, and occasionally you'd have a jar of pickles that didn't quite taste like they should have due to some chemical reaction going awry. I needed something less time-consuming that generated the same results, and I think I may have found the answer with lacto-fermentation! As is the case with most fermentation, bacteria is responsible for the process. This isn't the scary kind of bacteria like salmonella, though. Instead, we're talking about Lactobacillus bacteria that converts sugar into lactic acid. The bacteria was first observed in milk products, giving the bacteria its Latin name thanks to its abilities to convert lactose - the sugar found in milk - into lactic acid. Various strains of the Lactobacillus bacteria are found on the surface of all plants, and can be found in the gastrointestinal tracts, mouths, and vaginas of a number of animal species including humans. In other words, these bacteria are safe. 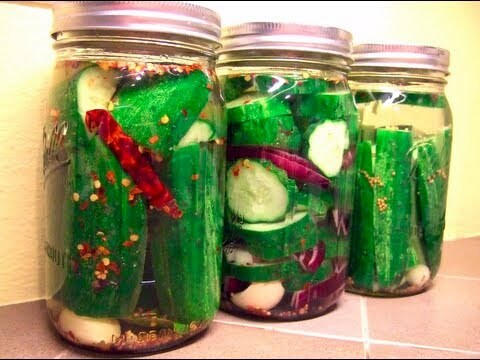 The science behind these bacteria being good for pickles and other preserves is that the lactic acid produced by Lactobacillus bacteria is a natural preservative that prevents or inhibits the growth of harmful bacteria. The lactic acid also preserves vitamins and enzymes, making most lacto-fermented products rich in nutrients that is good for the human body. On top of that, lacto-fermented pickles are considered "kosher" pickles due to the flavor profile made popular by New York's Jewish pickle makers who used lacto-fermentation to produce their pickles naturally. I can honestly swear that I don't have a kosher certification for my pickles, so I will not say they are tried-and-tested kosher by Jewish food laws. Today, most grocery store jars of pickles, sauerkraut, and other preserves are made with vinegar which offers more predictable results and is true "pickling", but do not offer the probiotic and enzymatic values of fermentation. 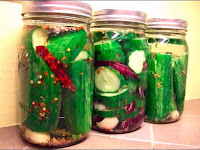 As stated above, the nutrients are preserved in the lacto-fermentation process whereas the vinegar in the pickling process will kill most of the good bacteria along with the bad bacteria. So what did I do with all those cucumbers? If you guessed "he made lacto-fermented pickles", your skills of deduction are top-notch! Using a fantastic and simple recipe from Jennifer on Deep Roots at Home, I went about making myself some dill pickles tonight! Much like the pasta sauce recipe I posted last week, I aim for simplicity and garden-to-table nutrition so that anyone with a garden can make good, wholesome food at home. I'll never claim to be a chef, but I do appreciate good food and nothing goes better with a sandwich than a thick deli-sliced pickle! On day 4 do a taste test of your pickles. They're ready when they taste done to you! Once they taste done, transfer the jar into the fridge to slow fermentation. Once fermented and in the refrigerator, you can remove the grape leaves and you don't need to worry about the pickles being completely submerged. That's important to remember because the fermentation process likes light and warmth. A cool, dark place like a fridge, a basement, or a cellar would be idea for the storage of these pickles once they're ready to go. Look for my results next week on this very blog! If you try this recipe out, let me know how it went for you as well! The man to the left? That's Emil Garipov. You may have seen his name on social media or in the news today and didn't think twice about it. 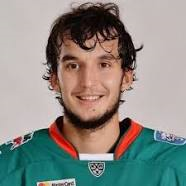 Garipov is a goaltender in the KHL, currently playing with Ak Bars Kazan. As you may be aware, the KHL's regular season started about a week ago, so there are some teams and some players still working off some of the summer hangover as they get back into hockey routines for this season. It seems that Emil Garipov is one of those players as today's game didn't go quite as well as he may have hoped. Without further adieu, let's see why Garipov's night may have been a little off as Ak Bars Kazan faced off against Amur Khabarovsk. Yeah, that's not good. Just 14 seconds after Vasily Tokranov had put Kazan up 1-0, Khabarovsk's Pavel Turbin launches a clearing attempt from his own end and finds space between the wickets of Garipov to make it a 1-1 game. Of the 25 shots he faced on the night, the 200-footer from Turbin is the one that got past him. In the end, Garipov did help Ak Bars Kazan to a 2-1 victory by stopping everything else he saw, but that one goal will probably haunt him for a few weeks. Before we go any further, let me just say that we see at least one of these goals in the KHL annually. I don't know if goalies are losing the puck in the crowd when the puck is raised above the level of the boards or if it's simply a momentary lapse in concentration. Either way, we usually have one of these highlights every season from the KHL. Garipov, for what it's worth, is no slouch in the net when it comes to his position. He's 86-50-15 in his career with Kazan since breaking into the league with the team in 2011-12 in both the regular season and playoffs. Over that span, he has a 1.86 GAA and a .933 save percentage to go along with 13 shutouts. It's pretty clear that the 26 year-old knows how to play the position. Here he is stoning Magnitka's Jan Kovar in last season's Gagarin Cup Playoffs on what looked like a sure goal. Sometimes, players just whiff on what appear to be the easy ones. As we've seen in numerous examples over the years, though, the shots from the other end of the ice can take funny bounces, skip like a stone across the water, and find their way past even the best netminders. This goal certainly won't define Garipov's career by any means, but he will be the topic du jour for the next week or two as sports highlight shows replay the clip over and over despite Garipov and Ak Bars Kazan getting off to a 3-0 start in the KHL this season. Sometimes, you just miss on the easy ones. It's that time of year. Players are starting to gather their equipment and book flights to the cities of their respective teams. Reporters are booking interviews with players via the team representatives while looking at the schedule. And while all that signals that hockey is close, there is one thing that triggers my hockey instinct as The Hockey News has published and delivered their latest edition of their annual Yearbook to newsstands! Every year, I add the latest edition to the pile of previous THN Yearbooks that I own, and this year is no exception as I picked up the magazine to the left in preparing myself for another season of hockey. What does this year's edition hold within its covers? 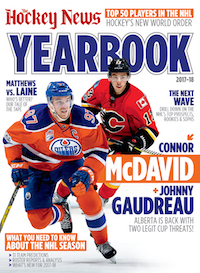 I shall take you through a few pages here and now as I review the THN Yearbook for another season. We seem to have this discussion every year, but somehow my province keeps falling into the "Alberta region" meaning I get a healthy dose of Oilers and Flames on the front cover despite there being a team much closer to me. Look, The Hockey News, you won a ton of Jets fans over with your bold prediction that the Jets would win the Stanley Cup in 2018-19, but to continually trot out Hall or McDavid and Gaudreau or Giordano is getting a little tiring. I'm just asking for a Jets cover once. Just once. Once we're past the cover, there's actually an interesting story from Jason Kay, Editor in Chief of The Hockey News, about how NBA coach and general manager Pat Riley trademarked the team "three-peat" in 1988. I had no idea that he had done this - if I did, I completely forgot about it - but there has yet to be an NHL team to pull off a three-peat since Riley's private company claimed the rights to this term. We've had a few back-to-back champions as Mr. Kay points out, and the Penguins are poised to take a run at putting some coin in Riley's pocket this season. I always love the section of the magazine where they post the polls they put out to fans on The Hockey News Facebook page. There are usually some surprises in this section as fans attempt to predict a number of things including next season's Stanley Cup-winning team. According to The Hockey News' fans, 27% of all respondents think the Pittsburgh Penguins will three-peat! They're just slightly ahead of the McDavid-led Edmonton Oilers at 24%. I'm not going to post all the results - buy the magazine! - but I thought it was pretty significant that the Penguins and Oilers were the two teams that fans were predicting to win the Silver Chalice. The annual compilation of The Hockey News' top-50 players is included, and I was shocked at some of the rankings. I'm not going to give you the top-ten, but I will tell you there are four centermen, three defencemen, two goalies, and right-winger in the top-ten. It's some of the lower-ranked players who had me puzzled. Is Jonathan Toews better than John Tavares? How much further ahead was Brad Marchand ranked compared to Alexander Ovechkin? Where does a player like Jack Eichel rank, and which players are ranked behind him? Let's just say that I came away with a number of questions on how these rankings were determined by the people at The Hockey News. Ken Campbell turns in an excellent piece on the elite group of defenders that David Poile has assembled in Nashville, and how each of Roman Josi, Ryan Ellis, PK Subban, and Mattias Ekholm were acquired with some behind-the-scenes information on how some of the acquisitions went down. Honestly, this might be the best piece on how the Nashville Predators were assembled that I've read, and Campbell deserves some kudos for getting Nashville GM David Poile and assistant GM Paul Fenton to spill some beans. Shelly Anderson spends some time with Sidney Crosby who reflects on coaching changes in his career and the impact his parents have played in his career. Ryan Kennedy chats with Jack Eichel about getting better as a player, taking a bigger leadership role, and his workout regimen over the summer. Matt Larkin runs down the Canadian teams' chances of bringing home the Stanley Cup as 25 years have passed since the Canadiens last celebrated on Canadian soil. David Pollak takes an in-depth look at Joe Pavelski and his impact on the Sharks as a leader on the ice and in the dressing room. Overall, there are some nice articles in this Yearbook that provide a little more depth to a few players. Finally, the annual team reports are always an interesting look at how the people at The Hockey News see the NHL. They rate the teams on offense, defense, goaltending, special teams, intangibles, rookies, an x-factor, and coaching and management. There's an invaluable depth chart that hockey pool participants will appreciate, and there's a good look at the rookies and players in the systems for each team who could be promoted at some time this season. Each of the 31 teams gets a thorough run-down with a fine-toothed comb by the experts at The Hockey News, and this should serve as your starting point for the season ahead. At the start of the team reports, though, there are the predictions made by The Hockey News. Again, I'm not going to reveal their predictions for who wins the Stanley Cup or who is in the Stanley Cup Final, but I will reveal a few key predictions. If you're a fan of the Los Angeles Kings, San Jose Sharks, Ottawa Senators, Philadelphia Flyers, or Winnipeg Jets, The Hockey News is predicting that there will be no post-season for you this year. Both the Central and Metropolitan Divisions send five teams to the playoffs as both wild card teams from each conference come from those two divisions. The Vegas Golden Knights are predicted to be last in the Pacific Division if you want to know where the new team is predicted to finish, and there's a lot to worry about in Denver with the Colorado Avalanche's ongoing struggles. However, as I wrote last season, The Hockey News has yet to predict the Stanley Cup champion and finalist correct in any year. Will this season follow that trend? Does Nashville have enough scoring after losing James Neal and Colin Wilson to make another run? Will Ottawa's magic be a one-and-done after losing a key defender in Marc Methot? Does Washington ever defeat Pittsburgh in the playoffs in the Ovechkin era? Are both Edmonton and Toronto poised to take big steps forward? All of this will be answered after the regular season closes on April 7, 2018 and we play into June once more. If there's one thing to be certain about as we embark on the 2017-18 season, it's that even the experts get things wrong when it comes to predictions. But that's why the games are played, right? 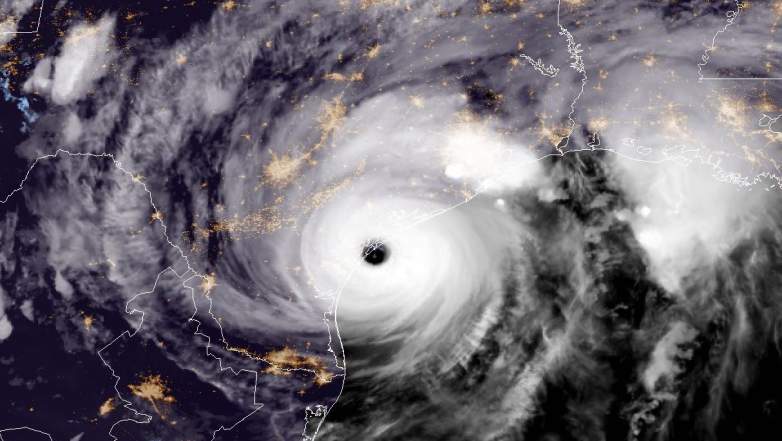 Hurricane Harvey has been pounding the Texas coastline this weekend. Having been to Houston and discovering a number of incredible sights and places in and around the Texas city, I am going to use this platform today to express my thoughts and wishes that Texas comes out of this waterlogged but safe. The amount of rainfall and flooding that has been described thus far is beyond belief, and there have been reports of people being displaced from their homes as the water rises along the coastline. To say this storm has been destructive might be the understatement of the year. There is no getting around the obvious in that Houston will never be the same after this storm. 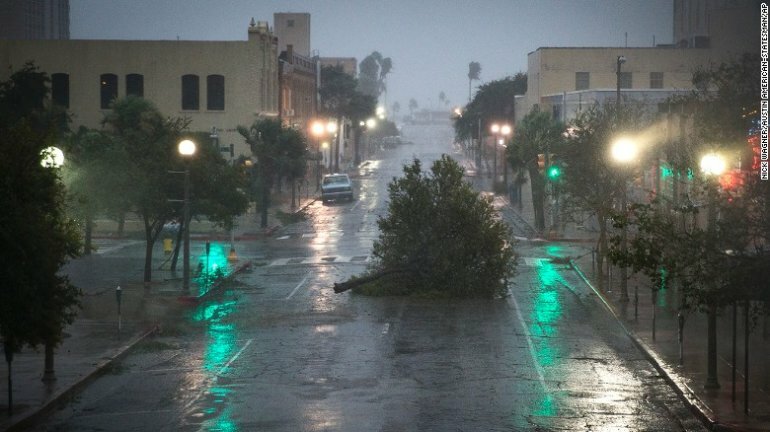 Some estimates have the rainfall to be more than fifty inches of rain as Hurricane Harvey weakens into a tropical storm. That's the annual rainfall amount for Houston in a normal year, not a weekend of rain. That's simply astounding. When I visited Houston, I arrived at the same time that Hurricane Hermine was weakening into a tropical storm. As I listened to local weather reports, the speed in which it made landfall caught me on a highway bridge with a number of other cars as we approached the northern outskirts of the city. It was almost a surreal sight to literally witness a wall of water moving towards you as you sat motionless in your car and helpless to what was about to happen next. The last thing I remember seeing before being engulfed by the torrential downpour was people abandoning their cars on the highway below the bridge for higher ground underneath the bridge. I have never seen rain like Hermine dumped on the group of us on the bridge that day. It was an incredible sound to hear that much water fall on the car that day. I couldn't see the car that sat a foot or two away from my front bumper, and the rail on the side of the bridge had disappeared into the downpour. For as long as I live, I don't think I'll ever forget the awesome power of the rain that day and how small it made me feel in its volume and sound. While the final tally on rainfall was a mere five inches - ten times less than what Harvey was going to dump on Houston - it was an incredible and surreal feeling to see the sun come out and shine brightly mere minutes after witnessing a moving waterfall pass over my vehicle. There was definitely a lot of water filtering into the storm drains, but this is where my experience moves away from what is currently happening in Houston. Harvey moved in on Houston today, so this is only going to be the tip of the iceberg as the storm slows to nearly a stop over the Texas metropolis. My hope is that every person in Houston finds a safe spot to take refuge if they couldn't make it out of the city. If - more likely when - they do get the forecasted fifty inches of rain, there's going to be a lot of water in the streets, in the buildings, and in vehicles around Houston. It's going to be humid in Houston for a while thanks to Harvey. Be safe, Houstonians. Help each other. Help the animals and pets. Do whatever you can to save, salvage, and hold onto your great city and its architecture. Talk to one another. Keep each other company, especially if people get separated from one another. Share supplies and knowledge, and offer up shelter and refuge if you can. You'll get through this, but it won't be easy. If anyone is looking to help, there are probably a pile of charitable options available. The American Red Cross and the Salvation Army are good places to start. They're going to need as much help to get Houston back on its feet. Until next time, keep Houston in your thoughts. I don't usually circle back to articles I've written in the past unless there's a major update regarding the topic. The man to the left in the Bruins jersey is Jay Thomas playing his beloved character Eddie LeBec on the hit TV show Cheers. Thomas passed away yesterday at the age of 69 after a long battle with cancer. The comedian and radio show host had a long string of characters on various TV shows that made him one of the most memorable recurring secondary actors of the era. The world lost a good man in Jay Thomas. I wrote an article on the character of Eddie LeBec and how he met his untimely demise on the sitcom Cheers back in November. While the back story of why he was written out is actually kind of crazy when you consider that it sounds like, from all accounts in the linked story, that Rhea Perlman wanted him off the show for good after he made a joke about Rhea on his satellite radio show. All that aside, Jay Thomas won two Emmy awards for outstanding guest actor in a comedy series for his portrayal of character Jerry Gold on Murphy Brown. He was deli owner Remo DaVinci on Mork & Mindy. Most recently, he played Marty Grossman on Ray Donovan. And perhaps his most remembered moment on TV happened each year since 1998 during the holidays when he would appear on The Late Show with David Letterman. "I loved Jay," Letterman told CNN in a statement. "His Lone Ranger story was the best I heard in 30 years. Plus, nobody could throw a football like Jay. Maybe Tina Fey, maybe. My heart goes out to his family." I actually remember a number of these appearances. Here is Jay Thomas telling what has been described as "the greatest talk show story ever." It's not often that I write about the death of an actor who went through the death of one of his characters, but Jay Thomas' portrayal of Eddie LeBec was one of the best story arcs that involved hockey in any television show to date. The world will miss Thomas' brand of humour and his ability to tell a story like no one else. Thomas is survived by Sally, his wife, and his three sons Sam, Max, and J.T. Rest in peace, Jay Thomas. Your brought joy and laughter to millions as a prime-time player on a number of sitcoms, and each of your characters is as memorable as you were. My only wish is that the laughter you brought to millions would have cured your cancer so we didn't have to lose a great man like yourself. 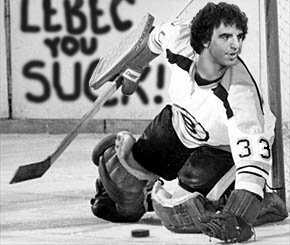 Until next time, raise your sticks in memory of Eddie LeBec! The Hockey Show is off-site tonight as we setup over at the Wayne Fleming Arena for a remote show! We don't often take the remote broadcast gear just down the road from the studio, but tonight we'll be interviewing players who literally will be minutes from going on the ice as the University of Manitoba Bisons women's team sits down for a season preview! It's been a while since we spoke to the players, so it will be good to get caught up and have a discussion! What have they been up to? What are the expectations they have for themselves and the team this year? We'll find out the answers to those questions and more tonight! While no players have officially confirmed their attendance, there have been a few who said they'd stop by. We'll see how that goes, and we'll see if we can nab one of head coach Jon Rempel or assistant coach Rob Voth for a quick feeler on what they expect from the team this year. We'll most likely end up talking about the other seven teams in Canada West as well as there were some key departures and arrivals for those teams whom the Bisons will play this season. We could have many stop by, but there certainly will be a few Bisons who wander over to the broadcast booth, so tune in and here what's been happening this summer for your Manitoba Bisons! How can you listen to the show, you ask? We suggest that you download the UMFM app on your phone or tablet. It's the easiest and most convenient way to listen to any of UMFM's great shows any time of the day, so go get it! Just follow this link on your iDevice or this link for your Android device and get the UMFM app! It's never been easier to tune into The Hockey Show or UMFM! Download the UMFM app today, and don't miss any of our great programming or shows! Tonight, Teebz and Beans are on-location at the Wayne Fleming Arena to chat with the Bisons women's hockey team only on The Hockey Show found on 101.5 UMFM and on the UMFM app! I'm taking the day off to run some errands. 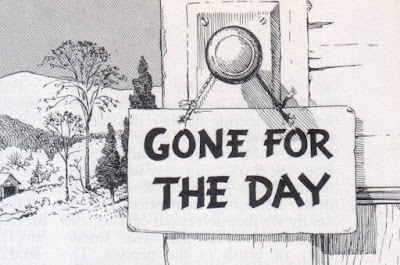 I'll be back tomorrow as usual. Hey, everyone deserves a day off, right? Exactly, and I'm taking one today. Have a good one, be good, and don't get into trouble! For those that are unaware, the move Slap Shot is celebrating its 40th anniversary this year. While we've lost Paul Newman in that time, there are still a number of stars who are enjoying the fruits of their work since filming the movie. 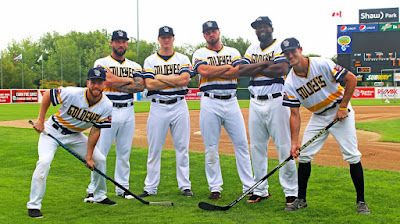 Tonight, the American Association of Independent Professional Baseball's Winnipeg Goldeyes decided to honour the movie and a few of its stars by donning the above uniforms in the style of the Charlestown Chiefs! As you may know, I'm usually against cross-sport promotions, but the connection between a minor-league "AA" baseball team and a minor-league fictional hockey team are about as far apart as one can get. In essence, this was like any Star Wars night or any other movie-themed night at the ballpark to me. The fact that it had to do with a hockey-themed movie made sit up and take notice. In town for the Slap Shot 40th Anniversary Golf Tournament at St. Boniface Golf Club to raise funds and awareness for concussion research, prevention, and treatment were Dave Hanson, Jeff Carlson, and Denis Lemieux who all had prominent roles in the movie. The three men were in the concourse at Shaw Park to meet fans and sign autographs, but the issue of concussions was a topic at the forefront all week and at tonight's game. "I can look back and tell you know that I had concussions," Hanson told Ted Wyman of the Winnipeg Sun. "The treatment then was sit on the bench, see how you feel later and if you're alert and you don't puke all night long, you're playing the next day." While the treatment and recognition of symptoms of concussions has changed dramatically over the last forty years, the fact that Hanson and Carlson are in town to talk about concussions despite depicting the most violent hockey captured on film seems a little ironic. Knowing that Hanson and Carlson most likely suffered from concussions, however, is why both men are here to try to raise funds for the reasearch, prevention, and treatement of the injury. "Forty years ago when the movie came out you weren't aware of concussions and the life-changing effects they can have," Hanson said. "Fortunately 40 years later we're all still together, we're alive and in good health. Some of us in this group have concussion symptoms to this day so it's great for us to have an opportunity to come out and be a part of this type of event and be involved." The golf tournament happened earlier in the day, and it seems that everyone enjoyed the atmosphere while helping out a couple of great initiatives that deal in concussion research. All proceeds from the tournament went to support the StopConcussions Foundation and Shoot for a Cure (SFAC) campaign. The StopConcussions Foundation is a concussion/neurotrauma educational and awareness platform for all sports, to address the growing trend of concussions in sports. It is an educational portal that players, parents, coaches and officials can visit to seek information regarding concussions, with the goal of becoming more aware and ultimately safer individuals in their respective sports. SFAC is a fundraising campaign that aims to reduce the incidence of concussions as well as to fund research to find a cure for paralysis caused by spinal cord injuries. Personally, this great event should happen more often as we see kids and teenagers diagnosed more often with concussions and concussion-like symptoms. "We want kids to play sports," Kerry Goulet, a StopConcussions co-founder, told Wyman. "Hockey is so much more than the actual game itself and we want kids to experience that. However, there's a caveat to that. We've got to make sure that if you are playing sports, get educated. If you're a parent putting your kid in sport, just understand that cause, effect and consequences. If there are injuries, follow proper protocols to allow your young son or daughter or even yourself to come back and play and play safe. We want to mitigate the risk, we're not going to eliminate it." In the end, raising money for research, treatment, and prevention of concussions is just makes sense. Brain injuries are often hidden, and the symptoms sometimes don't appear for hours. By learning more about the causes and treatment of these injuries and by investing in research for better protocols to identify concussions or concussion-like symptoms is a wise investment for everybody involved in sport. As for the ballgame, the Winnipeg Goldeyes were hosting the Sioux City Explorers and found themselves down 3-1 in the bottom of the seventh inning when Wes Darvill drove in Shawn Pleffner on his double and the Explorers walked in a run on four pitches to pinch-hitter Casey Turgeon with the bases loaded to score David Bergin to make it a 3-3 game after seven innings. The next inning would see Pleffner drive in Reggie Ambercrombie with a single to right-field after Ambercrombie had singled and stole second base to put the Fish up 4-3 in their come-from-behind rally! With closer Ryan Chaffee on the hill in the ninth inning, things got a little tense with the Explorers advancing a runner to third base with two outs, but Chaffee induced a ground ball off hitter LeVon Washington for the game's final out and his 19th save of the year on Hockey Night at the Ballpark! Even in baseball, we're seeing more concussions, so I'm 100% behind having hockey stars - even fictional ones - speak out in support of concussion research. All sports have seen an uptick in concussion reporting as science gets better at diagnosing concussions, so more money for research and prevention is needed. Having members of Slap Shot speak candidly about concussions is one thing, but having them help raise money for research is entirely a good thing. Well done to all involved on this night and at the golf tournament, and those Goldeyes jerseys are incredible! It's only August. I say that because it feels odd to be writing about serious hockey on August 21, but the KHL kicked off its regular season today and kicked off its tenth anniversary. 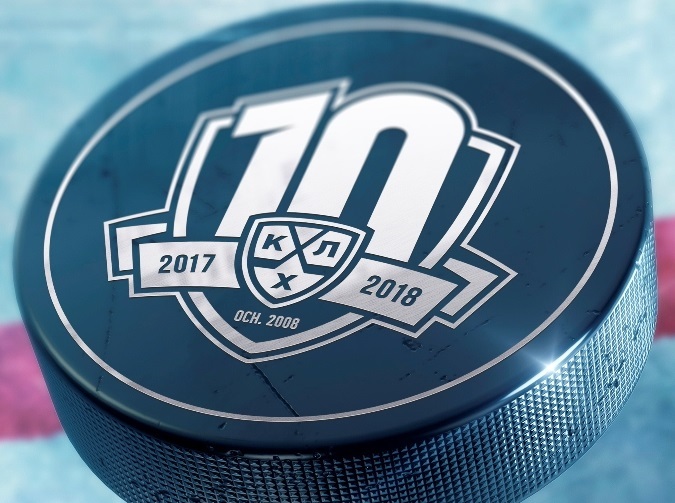 I was actually surprised that the KHL is only celebrating ten years since it feels like they've been around forever, but ten years ago the KHL started up its operations. While I haven't been keeping a close on the KHL as they prepare for this season and today's game between CSKA and SKA St. Petersburg, there are a few things that people should note about the upcoming tenth-anniversary season. While we didn't see any major names defect to the KHL for the opportunity to play in the 2018 Winter Olympics, there were a few players who opted for the Russian circuit as opposed to playing in North America under an NHL team. Justin Fontaine, Ryan Garbutt, Dwight King, Quinton Howden, Chris Lee, Andrei Markov, Alexei Marchenko, Mikhail Grigorenko, Ben Scrivens, Marc-Andre Gragnani, Jhonas Enroth, and Stanislav Galiev all opted for KHL contracts rather than trying to fight their way onto an NHL roster. All these men probably would have been good depth signings for a number of NHL teams, but they'll take their efforts over to the KHL with the hopes of making the Olympic rosters of their respective teams. Markov is an interesting case of the above names, though, as he literally only wanted to play in Montreal. When it was clear that Montreal was moving on from the 38 year-old defender, he didn't hesitate at turning to the KHL when it came to his next contract. Markov signed with Ak Bars Kazan after Danis Zaripov's suspension for performance-enhancing drugs. The move reunites Markov with his former coach Zinetula Bilyaletdinov whom he played under with Dynamo Moscow. Markov made it clear that this connection was part of the reason he chose Ak Bars Kazan over other clubs. "The fact that I played for Zinetula Bilyaletdinov at Dynamo, before I even went to the NHL, played a significant part," Markov told khl.ru. "I know what he expects of his players, and I'm really glad that we'll be working together again. You could say that it's thank to him that I became the player I am." I suspect that Markov will have a good year with Kazan under Bilyaletdinov as their top defender. Markov has played the most NHL games by any Russian player at 990, and those 990 games have given him experience against the best players in the world. The transition to the larger ice will take some adjustments, but I'm going on record to say that Markov will have a great year statistically in the KHL. "Iron" Mike Keenan will step back behind a bench after last helping Metallurg Magnitogorsk to a Gagarin Cup parade, only this time he will be running the bench for Kunlun Red Star. The 1984-85 Jack Adams Award winner and 1994 Stanley Cup winner will direct the KHL's youngest team which features a nearly brand new roster from last season where the squad made the playoffs. 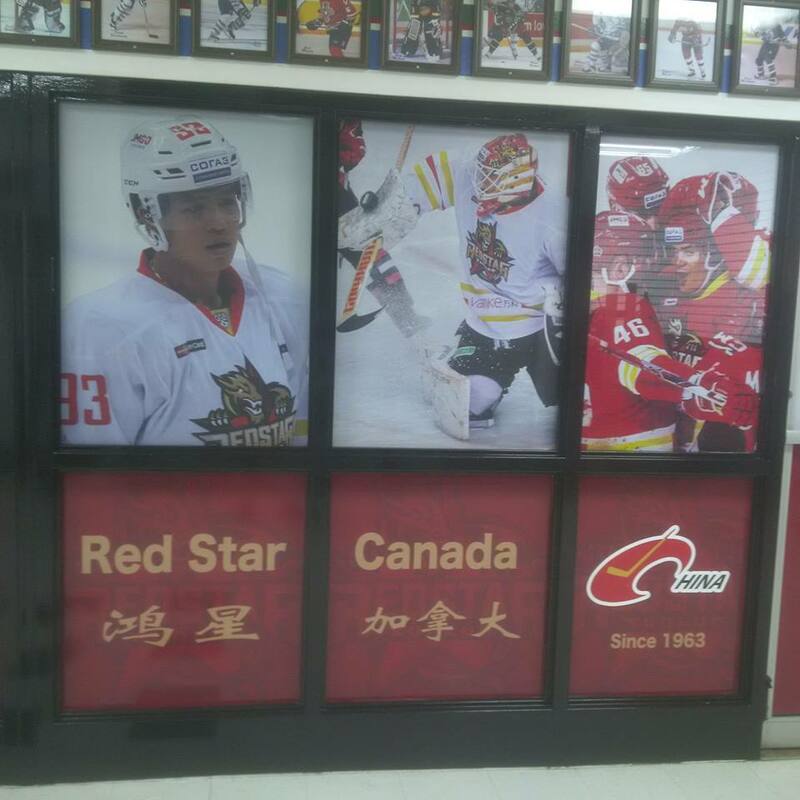 Keenan, who is in charge of the Chinese national hockey program, will get a first-hand experience with a lot of the players he's hoping will restore glory to the Chinese program as the Red Star roster is loaded with a number of players with Chinese heritage. "We can call our players talented, but they are not superstars like Mozyakin, Zaripov or Kovar," Keenan said at a press conference over the summer. "Plus, there's a layer of Chinese prospects who will hope to be part of the Beijing Olympics in 2022. It's going to be interesting to see how everything plays out during the season." There is a new wrinkle to the KHL this season. The KHL will move from a best-of-three shootout format to a best-of-five shootout format. Adding two additional shooters to the mandatory list of shooters will give the KHL teams with a pile of talent a chance to showcase that talent even more. Will this be a burden to the teams with less talent? We'll see how this plays out during the season. Of players who have yet to sign or retired this summer, Kazakhstani netminder Vitaly Kolesnik hasn't signed with a club as of yet, but the 37 year-old should be a depth signing in the KHL somewhere if he decides he wants to play. The 2006 Olympian and four-time World Championship participant still plays at a high level, but he's being pushed by the youth in the KHL. Former Maurice Richard Award winner Jonathan Cheechoo is also sitting on the sidelines at the time of writing. He will hold a special place in the KHL as he scored Zagreb Medvescak's first-ever KHL goal before also playing with Dinamo Minsk and Slovan Bratislava. He'll be 38 this season, so finding a roster might be tough for the former San Jose Sharks sniper. American Brandon Bochenski decided at the conclusion of last season to call it quits. The 35 year-old forward had a number of excellent seasons with Barys Astana, recording 397 points in 399 KHL games. He even claimed Kazakhstani citizenship to represent the team on the international stage after serving for so long in the Kazakhstan capital. His loss is a big loss for the American Olympic squad, and he will be hard to replace for Barys Astana as well. Aside from the three players suspended for doping this summer, it has been a pretty solid off-season for the KHL as they embark on their tenth anniversary season. Who will win the Gagarin Cup in this anniversary season? We'll know in a few short months! 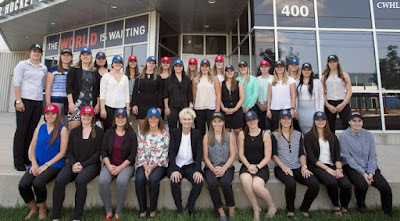 The CWHL Draft happened today. If you happen not to follow any hockey people on social media, you may have missed it, but I'm pretty certain if you're reading this blog you follow at least one person, right? Regardless, the CWHL Draft welcomed a brand-new class of players today to its seven teams as the two Chinese teams - Kunlun Red Star and Vanke Rays - made their first selections ever in a CWHL Draft, and the Thunder selected its first players under its new Markham locale. 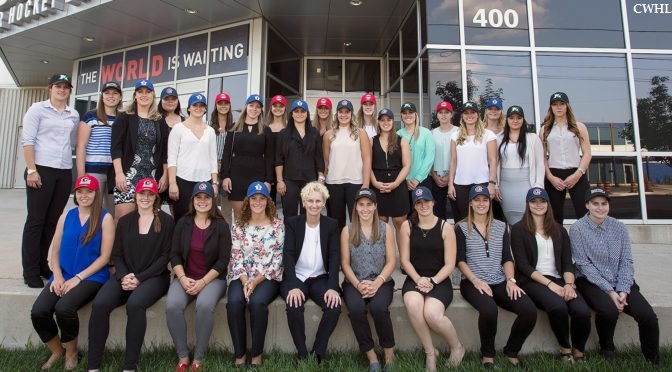 In short, today was a pretty special day for the decade-old women's hockey league, and there's a lot of reason for optimism as the CWHL embarks on its eleventh season of play! We'll start with the Boston Blades who held the first-overall pick. Newly-announced GM Jessica Martino selected Union College forward Courtney Turner with the first pick, and the Milton, Massachusetts-born Turner might have raised a few eyebrows as the top selection. During her four years at Union College, Turner amassed 11 goals and 17 assists in 83 NCAA games, but missed the entire 2014-15 season due to a torn ACL. She did lead Union in scoring in her freshman year, but her two points last season was more due to the knee injury she suffered midway through the season. I could probably write a whole entry on Union's women's program and the many flaws in it, but know that when she did play for Union she was an effective scoring threat and made the players around her better. That's why Martino drafted her, in this writer's opinion, with the Blades' first pick. The Toronto Furies were up next, and they chose Boston College forward Kristyn Capizzano with their first selection. There's no real mystery why Capizzano was an easy selection for Toronto. In her four seasons with Boston College, Capizzano scored 45 goals and 57 assists in 155 games, and she was an assistant captain for the Eagles in her senior year. The Oakville, Ontario native played in all situations with the Eagles, and she was a valued two-way player in all four years. 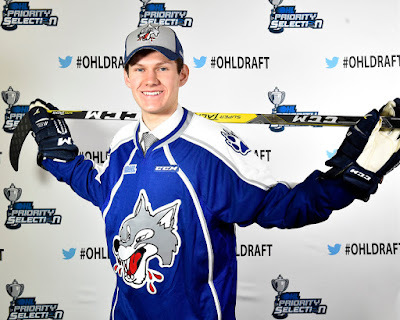 Toronto nabbed a great player in Capizzano who will help them at both ends of the ice. The first pick made by the Thunder as the Markham Thunder was Quinnipiac University defender Nicole Kosta. I'm not sure how or why Kosta is listed as a defender when she was a forward at Quinnipiac, but I just report these things. Kosta scored 39 goals and 84 assists in 137 games with the Bobcats over her five-year NCAA career, and that includes the 2013-14 season where she didn't play due to injury. Nicole suited up with the NWHL's Connecticut Whale last season where she notched six goals and eleven assists in 21 games as a forward. If they are going to use Kosta as a defender, she will give them a major boost on the offensive production from the back-end. If they use her as a forward, she's a proven scorer as well. Either way, the Thunder got a good player in the Mississauga-born Kosta. In what might have been the first no-brainer pick of the draft, les Canadiennes de Montreal selected McGill University forward Mélodie Daoust with their first selection. Besides being an outstanding scorer at the U Sports level in Canada, she was part of the 2014 Canadian Winter Olympic team that won gold at the Sochi Olympics. She was named as the CIS Rookie of the Year in 2012-13, and became the first player to be named as CIS Player of the Year the season following her rookie campaign. In 79 U Sports games, Daoust scored 71 goals and 96 assists - and that includes missing a season for the Olympics and part of the 2014-15 season with a knee injury! She might be the best pure scorer in the draft, and she's now part of les Canadiennes. The second Quinnipiac Bobcat had her name called next as the Calgary Inferno opted to select defender Taryn Baumgardt fifth-overall. The Innisfail, Alberta native scored 12 goals and 31 assists in 150 NCAA games, and was one of Quinnipiac's most reliable defenders. She was in second in blocked shots last season with 57, and she was used in all situations for the Bobcats. While her point totals won't wow anyone, her versatility in all three zones will play nicely into the Inferno's systems. Baumgardt will be an excellent, steadying player for the Inferno this season. Kunlun Red Star selected next, and they chose a player who we had already known would be heading to China. With their first selection in CWHL history, Kunlun Red Star selected Finnish goaltender Noora Räty. The 28 year-old's name should be fairly well known thanks to her long career with the Finnish national team and with the University of Minnesota Golden Gophers. She holds six NCAA records including winning percentage at 1.000, wins in a season with 38, and most wins all-time with 114. She's a two-time Patty Kazmaier Award finalist, a two-time NCAA champion, and an Olympic bronze medalist. Raty's reputation proceeds her in almost all situations, and she'll now try to help Kunlun Red Star capture the Clarkson Cup this season. 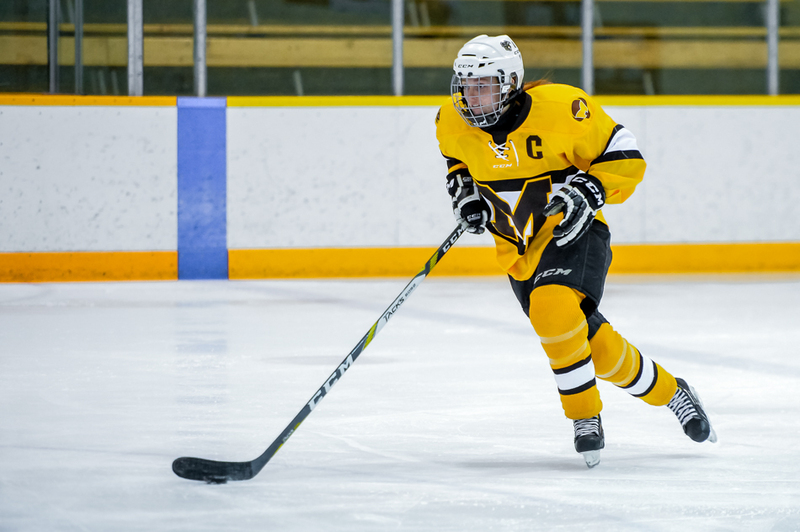 The Vanke Rays would make their first selection in CWHL history next as the final pick of Round One, and they selected Clarkson Golden Knights forward Cayley Mercer with the seventh-overall selection. Mercer's four-year career at Clarkson saw her crack the 20-goal plateau three times, and she finished her NCAA career with 80 goals and 98 assists in 160 games. She's a two-time NCAA champion, was a Patty Kazmaier nominee in her senior year, and is particularly skilled in winning face-offs. If Vanke wanted scoring, they'll get it in bunches with Cayley Mercer. Lindsay Grigg - Markham Thunder (R2, 10th-overall). Grigg is a skilled defender who played one season in the NWHL before moving to HV71 in Sweden. She served as an alternate captain with HV71 and recorded eight goals and ten assists. Kelly Murray - Calgary Inferno (R2, 12th-overall). Murray led all defenders in scoring in Canada West last season as a member of the UBC Thunderbirds, and helped UBC win the Canada West title and the bronze medal at the U Sports National Women's Hockey Championship. Alex Carpenter - Kunlun Red Star (R2, 13th-overall). Carpenter is the 2015 Patty Kazmaier Award winner, a silver medalist at the 2014 Sochi Olympics, and a multiple gold-medal winner with Team USA at the IIHF World Championships. She played with the NWHL's Boston Pride last season and played in the NWHL All-Star Game. Elaine Chuli - Vanke Rays (R2, 14th-overall). The Rays got their goalie in UConn's Chuli. Chuli holds all sorts of records at UConn, and she'll be expected to bring her strong goaltending to China to help the Rays in their first year. Bulbul Kartanbayeva - Boston Blades (R3, 15th-overall). The Kazakhstani-born Kartanbayeva dreamed of playing hockey in the US, and she'll get that opportunity after the Blades selected her. Her videos on Twitter show a ton of raw talent, so there's hope she can make the squad. Shiann Darkangelo - Kunlun Red Star (R3, 20th-overall). Darkangelo was a marketable star with the NWHL's Buffalo Beauts, and she'll join the Red Star team in China. She recorded 17 goals and eight assists in 29 NWHL games. Devon Skeats - Markham Thunder (R4, 24th-overall). Skeats is another former NWHL player who made the jump to the CWHL. In 31 NWHL games with the Buffalo Beauts, Skeats recorded 13 goals and seven assists. She'll be counted on to play solid defence for the Thunder. Lindsey Post - Calgary Inferno (R4, 26th-overall). Post was named the U Sports National Championship MVP last season after backstopping the Alberta Pandas to the national title. She was constantly one of the top goalies in the nation in U Sports hockey. Zoe Hickel - Kunlun Red Star (R5, 34th-overall). Hickel was another player rumoured to be heading to China. She played two seasons with the NWHL's Boston Pride and last season with the Connecticut Whale where she posted seven goals and nine assists in 31 total games. Emily Janiga - Vanke Rays (R5, 35th-overall). Janiga graduated from Mercyhurst University with 72 goals and 79 assists in 141 games before joining the NWHL's Buffalo Beauts last season where she scored six goals and five assists in 17 games. Ashleigh Brykaliuk - Vanke Rays (R6, 42nd-overall). The former captain of the UMD Bulldogs graduated with 62 goals and 83 assists in 146 NCAA games, and she was a dynamic scorer for Team Canada at the World U18 Championship. The Brandon, Manitoba native will certainly add scoring and depth for the Rays. Mariya Sorokina - Markham Thunder (R10, 66th-overall). The Russian-born goalie won't supplant Knox or Howe immediately, but Sorokina has options. She won a bronze medal at the 2016 Women's World Championship, and her stock should rise if she gets to play against the best competition on the planet. The full list of drafted players can be found here, but those players are the ones that caught my attention. There are still others who could be difference-makers on their new teams - Brooke Webster, Hanna Bunton, Sydney Kidd - so we'll see how next season breaks down as the players look to capture roster spots. For now, there were 113 players who will be welcomed into the league at some point in their careers, and the CWHL is better with all these players involved! As we had discussed with Tyler Fines on The Hockey Show on Thursday, there were rumours that the Kunlun squad was looking to send some of its younger players over to North America to participate in leagues here and in the United States. As you can see to the left, Kunlun Red Star's logo is now prominently featured on the doors to Rink 2. 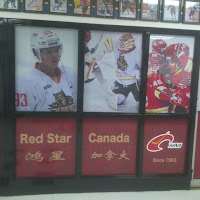 The question is where are these doors and which Kunlun teams are playing behind them? Those answers can be found below, but it should be noted that the Kunlun teams in question will be playing in one city and not touring the country on a cross-continent exhibition series. The rink pictured above can be found at Chesswood Arena in North York, Ontario. 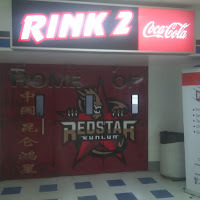 According to reports, Kunlun Red Star is basing their U20 and U18 teams at this rink for play in leagues at the arena. There were no mentions whether this meant there would be four teams playing out of the rink - one men's team and one women's team for each age group - but one would hope that the Red Star management group would see the value of sending both the men and women over to play. While the Red Star have officially moved in after getting some window dressings installed, I'm curious as to who they will be playing. There are midget teams based out of the Chesswood Arena in the Toronto Aeros and the Toronto Red Wings so there will be competition on-hand if the KRS U20 men's team needs some opposition, but I didn't see any women's leagues listed. There may indeed be a woman's league that plays there, but they aren't listed on the Chesswood Arena site. Nonetheless, we do know that the Red Star have landed in North America, and they're getting themselves ready for hockey action this winter! China certainly is going all-in for 2022 with these developments, and they will officially add more players to the fold when the CWHL Draft goes tomorrow. I can't say whether this plan will work on such a short timetable, but China seems to be going for broke in an attempt to win a medal on home ice in Beijing. They're certainly doing all they can to prepare for their Winter Olympics, but is there enough time? Getting their younger players into North American leagues with four years to go before the puck is dropped in the 2022 Beijing Winter Olympics is a smart move for exposing their younger players to some of the best minor-league hockey North America has to offer. You just hope they won't be overwhelmed by this experience. Big stick-tap to Hockeytoronto.com for the photos! I'll put this notice upfront: I'm not happy writing about the University of North Dakota's hockey program. As you may recall, they only have a men's program to speak of after they cut the women's program and set twenty-five women adrift. However, today's article is all about what the Fighting Hawks will wear this season as the school decided to update the uniforms to reflect their newer name. Unveiled on Thursday afternoon, the new Fighting Hawks jerseys will be what you see above. There are a few differences from last season's jerseys that should be noted. UND opted for a new font for "North Dakota" on the front of the jersey that matches what was unveiled last season with the new logo. Also changed is the Fighting Hawks logo on the shoulder, replacing the interlocking "ND" that once called the shoulder home. From the image above, those are the noticeable changes. Among the changes not shown in the image above, the font for the names and numbers on both the front and back will not follow suit with the new font. They will remain as block lettering on these new uniforms. I suspect this will make either the "North Dakota" or the names and numbers look off since there are now two fonts being used in close quarters. I don't understand this thinking, but people who are smarter than me approved it. Let them deal with it. I have always liked the green uniforms, but this kelly green jersey looks phenomenal. As I have always maintained on this blog, green might be the most under-utilized colour in the hockey world, so seeing the green road jerseys pop as nicely as they do is a huge plus. On the opposite side of the spectrum is that black jersey which is both unnecessary and awful. I will never understand why a team that has an amazing road jersey opts for a black uniform, especially when white is worn at home. If the black uniforms are only worn on the road, don't sacrifice your best look for black. That kind of thinking gets people committed. I commend both UND and CCM for using an actual hockey sweater template for this new look. Great arm and hem stripes and a solid shoulder yoke give this uniform a very traditional look. I'm not a fan of the lace-up collar, and I don't really like the idea of the "collegiate look" with the name of the school surrounding the number, but I suppose the latter is appropriate on an actual collegiate team. I'd love to see the Fighting Hawks logo on the road jersey, but it seems people smarter than I approved this design. The cool thing about these uniforms? They'll first see the ice on September 30 when the University of Manitoba Bisons men's hockey team visits Ralph Engelstad Arena for an exhibition game. The Bisons have yet to win in Grand Forks, so this might be the best time to spoil the party with the Fighting Hawks in new threads. It will take some serious work as UND always has a solid team, but Manitoba should be ready to go after their brief European tour this fall. What do you think of the new UND jerseys? Leave your thoughts below! The Hockey Show is back on the UMFM radio frequency tonight, and we're going to bring a potpourri-style of a show tonight as we go through a number of stories from around the hockey world. First, though, we have a returning guest who has a unique perspective on some of the major stories from the hockey world this summer. He's still involved in a way with the stories, but he's not as directly involved as he once was. We'll get his viewpoints on the major stories before breaking into a number of cool stories from around the hockey spectrum in the second-half of The Hockey Show! 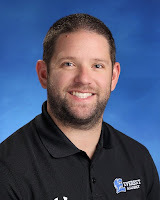 The Hockey Show is proud to welcome back former head coach of the CWHL's Brampton Thunder, Mr. Tyler Fines! 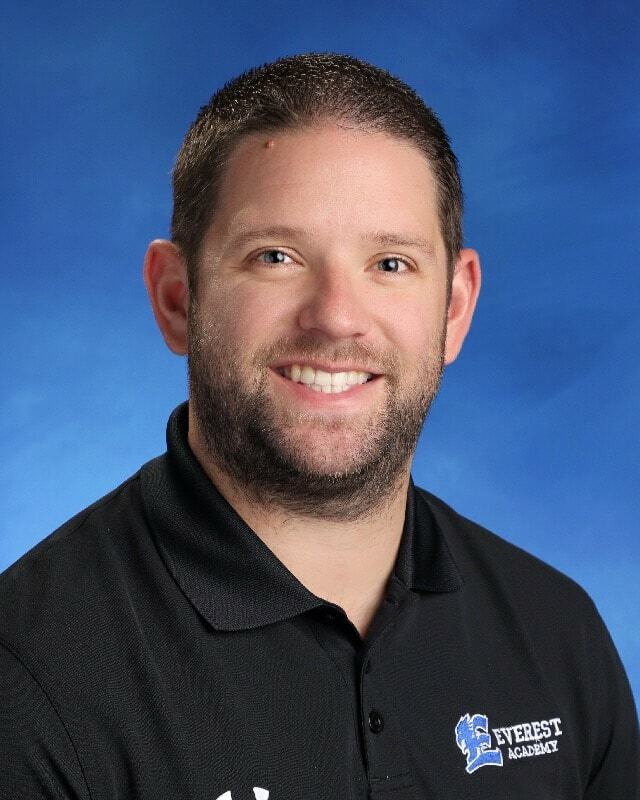 Tyler is now the head coach for the Etobicoke Dolphins Midget 'AA'​ Hockey team in Ontario where he is responsible for the development of 2000-, '01-, and '02-aged female hockey players and the promotion of these players to the PWHL, NCAA, and CIS ranks. Tyler's work in this midget hockey league will see him working with some Chinese-Canadian athletes as well as being able to offer unique insights into the CWHL expansion to China this summer. We're excited to have Tyler back on the show, and we'll try to squeeze as much information out of him as we can! On the second-half of The Hockey Show, we'll take a look at a couple of stories the CBC ran this week about three First Nations women heading south to play hockey at a prestigious Boston-based hockey school, the Sagkeeng Oldtimers team made up of residential school survivors who will now have a place at the Hockey Hall of Fame in Toronto, and the struggles a women's league in Kenora is having in getting ice-time. 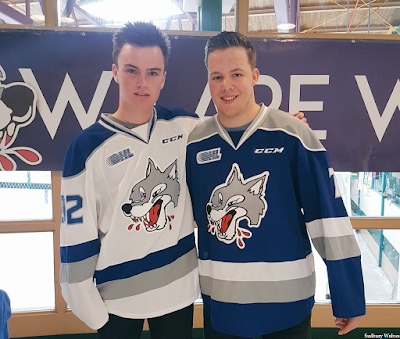 We'll also touch on the Sudbury Wolves looking sharp, Hockey Canada's U18 women's team kicking off play against Team USA in a three-game set in Lake Placid, New York, and the Aalborg Pirates are back on the ice and winning games so we'll update everyone on how Brandon Reid and his team are doing! There's lots to chat about tonight, so make sure you tune in! Tonight, Teebz and Beans chat with Tyler Fines about a new job and the CWHL before bringing up up-and-coming stars, Hall-of-Famers, beer-leaguers, Wolves, Canadian women, and Pirates only on The Hockey Show found on 101.5 UMFM and on the UMFM app! As we're all aware, there will be a new addition to the NHL schedule this year for all thirty teams as the Vegas Golden Knights join the league. The NHL has expanded a number of times through its own decisions or via merger, so I thought it would be a good idea to get into another book. 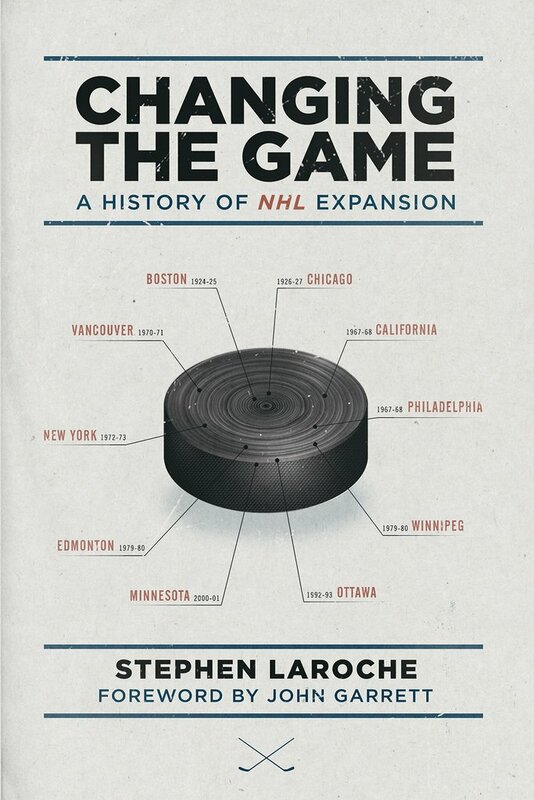 Teebz's Book Club is proud to review Changing The Game: A History of NHL Expansion, written by Stephen Laroche and published by ECW Press. If you're into cool facts and interesting stories, Mr. Laroche's book will take you through every expansion team from the start of the NHL right through to the addition of the Columbus Blue Jackets and Minnesota Wild with all sorts of incredible detail on each addition to the NHL's fraternity. It seems Mr. Laroche is very good at staying behind the lens as opposed to being in front of it as I couldn't find an image of him! Nonetheless, from the back cover of the book, "A seasoned hockey historian, Stephen Laroche has a distinct passion and deep appreciation for many aspects of the sport's history. The editor of Beckett Hockey and Beckett Basketball, he is former trading card company executive. He lives in Belleville, Ontario, with his wife, Michelle, and stepdaughter Guenevere." Changing The Game doesn't just highlight the moments of each NHL team's founding. Instead, it takes you through the founding of each team and the first year of the team's existence before highlighting some key players from that year. There is a lot of amazing information contained within these synopses of the teams, and the research done on the players is top-notch. Needless to say, Changing The Game is thorough and detailed. There are sections for every NHL team, and there are even small sections that deal with the WHA and the business side of the merger with the NHL. The one thing that Changing The Game doesn't cover, however, are relocations. There are no chapters on the New Jersey Devils, the Dallas Stars, the Arizona Coyotes, the Colorado Avalanche, the Carolina Hurricanes, or the new edition of the Winnipeg Jets. There are mentions in the sections of each of the teams from where they were located on how the team moved, but relocations are not included in Changing The Game. This book looks only at the various expansions done by the NHL. Team owners were finally convinced by William M. Jennings that to head off a catastrophe, they needed to double their membership to 12 teams. Clarence Campbell announced these intentions in March 1965. Some of the cities deemed acceptable or potential sites for new clubs included Vancouver, San Francisco-Oakland, Los Angeles and St. Louis. Less than a year later, the NHL was presented with 14 different applications - five from Los Angeles, two from Pittsburgh and one each from Philadelphia, San Francisco-Oakland, Baltimore, Minneapolis-St. Paul, Buffalo and Vancouver. It's hard to believe, but the Philadelphia Flyers may not exist today had the applicants from Baltimore been better organized with their application. Of course, six of those cities were successful, and we'd see both Buffalo and Vancouver get teams a few years after that 1967 expansion year. I'd be interested in seeing what happened with the other unsuccessful applicants who weren't awarded teams, but that may be another book altogether! Whether you're just getting into the game or have deep knowledge of the inner workings of hockey, Changing The Game has something for all fans. Newer fans could use Changing The Game as a textbook on how the teams got started while those who have followed the game for years may find some new facts to complement the depth of their current knowledge. Changing The Game is an incredible book of facts on the beginnings of all the current NHL teams. Because of the research and information contained within the covers, Changing The Game absolutely deserves the Teebz's Book Club Seal of Approval! You can find Changing The Game at all major bookstores and libraries. I would recommend purchasing the book, though, and keeping it handy as a reference book when it comes to the amount of information stored on its pages. There are certain elements of a hockey jersey that make them look like old-time hockey sweaters. They usually include things like the hem stripes, the sleeve stripes, and a traditional V-neck-type collar. Anything else might be team-specific, but those are the generic "old-time" features of a hockey jersey that make the jerseys timeless as they are for the Canadiens, Blackhawks, Rangers, and Red Wings. Junior hockey clubs seem less inclined to make sweeping changes unless necessary, so there are still some timeless jerseys seen in the CHL as well. 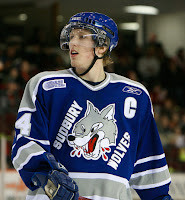 One team that decided to move away from the traditional sweater look was the Sudbury Wolves when Reebok got involved a decade ago, but it seems that Sudbury is going backs to its roots with yesterday's changes and it might be the best jersey unveiling this summer! 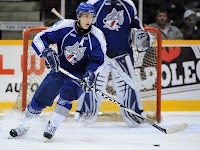 Let's start with the old look that the Wolves introduced seven years ago as modeled by Owen Lalonde. First off, you already probably know that I hate the vertical apron straps on these jerseys, and it makes the logos and captaincy designations worn on the front of the jerseys look absolutely ridiculous as seen on Marcus Foligno to the right. His alternate captain's "A" is basically in the middle of the jersey at this point! In past years with the apron strings, the Wolves applied the captaincy marks over the vertical piping, but both looks are absolutely ridiculous. The shoulder yoke simply extends to the wrist, eliminating sleeve stripes, and the hem stripes are non-existent. Basically, this was "Reebok design" to a tee, and I was never a fan of it. Let's jump seven years ahead to present time where the Wolves will wear the following this upcoming season. Now that's more like it! While the uniform clearly is still modern with today's lightweight fabrics and the slimmer cuts, the traditional elements have returned to make the Sudbury Wolves look more like a hockey team and less like an aggressive Chopped Canada team. There are great stripes that use the secondary colours well, there are traditional shoulder yokes that really makes the colours pop, and the logo is now the focal point for the eyes when looking at the jersey. This is what hockey is supposed to look like, and the Wolves are looking fantastic! "The new look is really a fresh design, with a clean look that salutes some of the more successful seasons of the organization wearing the blue and whites," Andrew Dale, VP of Marketing & Development, told reporters at the press conference. "Launching a new jersey designs is one of the most fun aspects of working in sports and marketing. We consulted with key stakeholders to get their opinions; from alumni and players to fans volunteers and as an organization we felt the timing was right to signal a change in the new era of Wolves' Hockey. 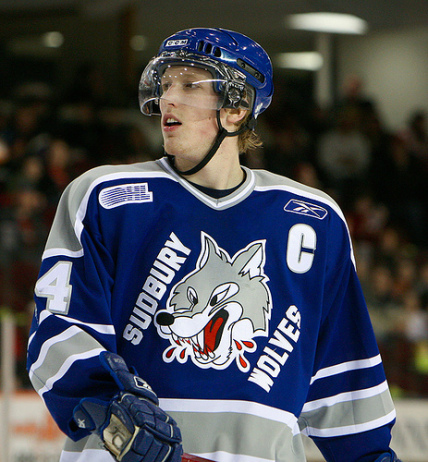 The jersey change is a symbol of what this edition Wolves organization believes – respect for the past, our history and tradition but a firm grasp of a fresh clean and bright future." That past is one that is hasn't seen a ton of winning, but going back to the team's heady days where they looked great isn't a bad thing. As seen on Marc Staal, there are a few differences due to the modern jersey template, but the style elements have returned. Sudbury's play on the ice needs to be improved as much as their jerseys have as they currently hold the OHL's longest championship drought and the third-longest drought in the Canadian Hockey League. They've only been to the OHL's J. Ross Robertson Cup Final twice, and lost both times in their 45 years of being in the OHL. However, they do develop serious NHL talent as they have sent 77 players to the NHL including the likes of Mike Fisher, Mike Peca, Dave and Dale Hunter, Pat Verbeek, and the aforementioned Staal and Foligno. So what do the players think? "When we got a sneak peak at them in the spring before leaving for the summer with some of the guys, we were stoked to see this change," Reagan O'Grady told reporters. "I think that this small change reflects the feelings that Wolves Hockey matters and that people are excited about what's going on at the arena. This year there is just a completely different feeling going into the season and that's exciting." If you look good, you feel good. That may translate into more on-ice success for the Wolves this year, but they're already light years ahead in the fashion department for the changes seen here today. 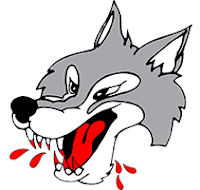 I never really had the Sudbury Wolves among my favorite teams, but these changes have brought the hockey look back to Sudbury, and that's a great look for the upcoming season! With autumn rolling in like a locomotive on what seems like an already-short summer, Hockey Canada is gearing up for another big season of hockey. Yes, there's that little tournament known as the Olympics that they'll participate in and they always have teams for the World junior Championship and the IIHF Men's Hockey Championship, but there are other segments of the population that get to represent Canada on the world's stage as well. After spending eight days in Calgary, Hockey Canada has pared down its roster of invites from the U-18 camp to 24 women who will wear the maple leaf in a three-game set against Team USA beginning August 17 in Lake Placid, New York! "We want to congratulate all 42 players who took part in the selection camp, and thank our staff for a phenomenal week. As we expected, these young women showed up ready to work hard both on and off the ice, and they made our decision very difficult," said Delaney Collins, head coach of Canada's National Women's Under-18 Team. "Congratulations to the 24 players who were selected to play in Lake Placid; you've earned this opportunity, and we’re excited to work with you and continue to see you develop over this upcoming series." While Ontario, Quebec, and Saskatchewan will have the most representation on the team in terms of which provinces the girls call home, the roster is made up of a unique mix of players. Four players are returning silver medalists from the 2017 IIHF U18 Women's World Championship, and five played in the 2016 three-game summer series against the United States. I'll denote these players on the roster below so you can see who the returning "veterans" are, but there are some other interesting notes from the development camp that just finished. First, Logan Angers of the St. Mary's Academy Flames in Winnipeg had an outstanding camp statistically, but was not chosen as one of the goaltenders. Her stats line of 30 saves on 31 shots, a 0.64 GAA, and a .968 save percentage in three appearances would have led me to believe that she made the cut, but she was victimized for her only goal-against in the final intra-squad squad in overtime to give Canada-Black a win over Angers' Canada-Red team. I'm not saying this is the reason why she was cut, but her stats were arguably as good or better than the three goalies selected. That's not to say that any of the goalies who were selected don't deserve the honour, but it goes to show just how close the competition is when it comes to picking the right players for this opportunity. Second, it seems this team is built not for this three-game series, but the eventual goal of capturing the gold medal at the 2018 IIHF U18 Women's World Championship in Dmitrov, Russia. I have no issue with this future planning at all, but I would like to see Canada lock in on the majority of players they want for that tournament. As Hockey Canada's press release states, "Hockey Canada scouts, along with the team's coaching staff and general manager, will continue to evaluate players with their provincial and club teams during the 2017-18 season, including at the 2017 National Women's Under-18 Championship in Quebec City". That means that players like Angers or any of the other women sent home could be back to play with the team in Russia if they continue to see their stocks rise. I believe that they have a good idea of who they want on that squad, but you just don't want to mess with chemistry too much as the tournament approaches. After saying all that, here are the 24 women who will represent Canada later this week in the three-game set. The ladies will begin their quest to gold this Thursday against the US U18 women's team in Lake Placid followed by Game Two on Friday and Game Three on Sunday. The overall results of this three-game series with the American women isn't focused on winning or losing, but developing a squad that's ready for Russia. If the end is a gold medal, I'm ok with the means if we lose all three games despite playing hard. After all, the big dance happens in Russia in January. Teebz's Book Club has a pile of books that need their spines cracked, but I'm slowly working through this pile. With summer being more than busy for me, it's hard to just grab a seat and plow through two hundred pages of a book. That being said, I do try when the time allows for it and today was one of those days. Teebz's Book Club is proud to review Body Check, written by Matt Christopher and published by Little, Brown and Company. This book is aimed at younger readers as Brent Mullen and his Badgers teammates look to improve on a .500 record the year before. However, it seems the team's strategy changes with the addition of a new assistant coach and his son, and this leaves Brent questioning his desire to play on the team! Matt Christopher authored more than one hundred novels and three hundred short stories in his life. Born in Bath, Pennsylvania, Christopher was an outstanding athlete in his youth, but his interest in writing began around the age of 14. He would see his first story published at the age of 24 in a detective magazine. After graduating from high school, Christopher played professional baseball for the Smith Falls Beavers in Ontario before he was cut after he couldn't make contact. Christopher would return home to New York before a knee injury reduced his sporting endeavors entirely. 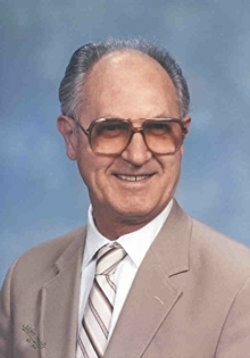 He married Catherine "Cay" M. Krupa on July 13, 1940, and worked at the National Cash Register in Ithaca, New York until he retired in 1963. Upon retiring, Christopher took up his passion for writing after having had 15 books already published. Unfortunately for readers, Christopher died September 20, 1997 in Charlotte, North Carolina after complications arose in surgery for a non-malignant brain tumor at the age of 80. He won the annual Milner Award as "the author whose books are most liked by the children of Atlanta, Georgia". When asked why he wrote sports books for children, Christopher answered, "Sports have made it possible for me to meet many new people with all sorts of life stories, on and off the field, and these are grist for this writer's mill." In reading Body Check, I felt a little out of my element with some of the explanations of terms that Matt Christopher works into the story. While I get that not all youth readers may know what a power-play is, I struggled when Christopher continually used the term "flip shot" when he really meant "wrist shot". It literally tripped me up a couple of times as I read through, so just be prepared that if you award this book to your younger player you may have to explain a term of two that isn't in the parlance of hockey. That being said, the story contained within the covers of Body Check is one that most parents and players will struggle with or have struggled with as young players get older. While the Badgers seemingly haven't had a big season with a lot of wins recently, Brent is fairly content with the job that Coach Maxwell is doing as the Badgers' head coach. He has seen his older brother, Lee, become one of the best players at his high school, and he learned under Coach Maxwell. However, a new addition to the team in the form of Vic Seabrook and his father and former player, Mr. Seabrook, have a different attitude towards winning that Brent doesn't like. Brent and the Badgers had been using speed and skill to win games under Coach Maxwell, but it seemed that Coach Seabrook wanted players to resort to doing anything possible to win, and that included playing dirty. Brent found himself at a crossroads as he knew that type of play wasn't right nor did he want to play that way, but he also questioned whether or not Coach Seabrook's methods accomplished more. The kind of hockey that Coach Seabrook was teaching went against everything he believed - and not only about sports but life in general. Rules were there to be followed. He was certain of that. But then a scary thought came to him. Could it be that Coach Seabrook was right? That what made some players winners and others losers was that winners knew when to cheat and get away with it? Maybe that was what it was all about, and Coach Maxwell had it wrong. Maybe Lee was wrong too... after all, Lee might be a few years older than Brent, but he was basically still a kid himself. Brent wished he could be sure. And he wondered, too, if the way Coach Seabrook taught hockey was the way it was supposed to be played. If so, could he play that way? Did he even want to? And that's the struggle that Brent goes through in the book. Despite Mr. Seabrook's insistence that this is how hockey is played and that "sometimes accidents happen", Brent and several of the Badgers players struggle with this new outlook while Brent's best friend, Cam, embraces the "winning" mentality. With a game coming up against the undefeated Cyclones, will this new style of play hurt the Badgers? Will they be able to defeat the Cyclones? Will Brent finish the season as a Badger? All of these questions are answered in Body Check! There are some strong lessons in Body Check that shouldn't be overlooked. The importance of learning important fundamentals and playing the game the right way as opposed to cheating and intimidation of an opponent is the main theme, but questions of right vs. wrong will enter the story at times, friendships will be tested, and apologies will be given and accepted through the 137-page novel. Mr. Christopher does a great job in bringing these tough moral questions to the forefront in his writing, and they are lessons that every parent should have with their young player at some point. Because of these lessons, Body Check will get the Teebz's Book Club Seal of Approval! 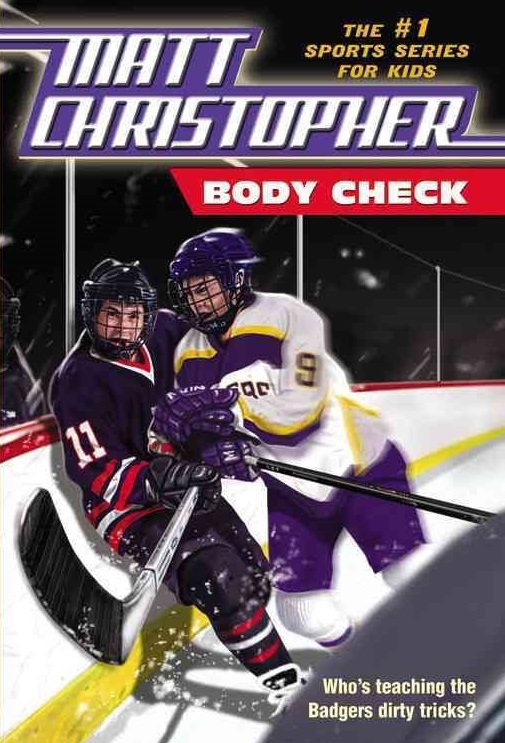 Find Body Check at your local bookstore or library in the young readers section, and let your young all-star work through the entire series of Matt Christopher books! The hockey world, and the world in general, lost an incredible man today as it was announced that Bryan Murray passed on after a long battle with colon cancer at the age of 74. Murray was a very unique individual whose sharp mind and ever sharper retorts to questions were appreciated by all. The courage he showed in his battle with colon cancer not only showed his inextinguishable human spirit, but showed that Murray would not let cancer slow him down. 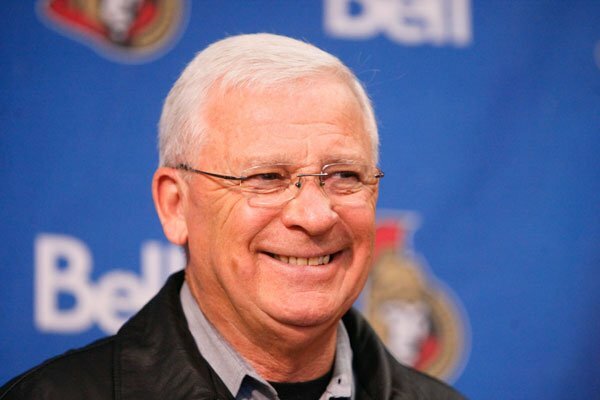 Losing a man like Bryan Murray today seems a little unfair considering all he did for the game of hockey, the players and personnel he met and gave chances to regarding their dreams, and the countless fans who had experiences with him. He will be missed. For the last three years, Murray had been battling Stage 4 colon cancer, and he told TSN's Michael Farber in 2014 that there was not going to be a last-minute victory in this battle. "The word is we'll keep doing chemo and, hopefully, reduce the tumors and the effect and I'll get some time out of that," Murray said. "There is no cure for me at this point." As per the report linked above, "According to doctors the cancer had been living in Murray's body for seven to 10 years before it was caught." "The frustrating part – and I've said this to several doctors since then – is, 'How come there were no signs?'" Murray, 71, asked. "When you hear that you've had cancer for possibly up to 10 years and there were no signs... obviously, because of the Stage 4, it had moved through my body." "Let's go to extra overtime and keep playing like the game we played against the Islanders many years ago and we went to four overtime periods," Murray said. "Let's just keep it going as long as we can, be as healthy as we can for that time, and enjoy what we have as we do it." "Players always have good things to say about Bryan," Poile said. "He knew how to communicate with players. Sometimes it was his sense of humour, his sarcasm, but he just knew how to get through to them and in response they played for him. He knew how to motivate players." There might be no greater compliment one can give a coach than what Poile said of Murray. But it wasn't his coaching legacy that Bryan was most proud of as he was often fondly remembered as a loving husband, devoted father, doting grandfather, and loyal friend. Bryan's connection to everyone he met, to his friends, and to his family was vitally important to him, and he would often do whatever he could to put those people he cared for ahead of himself. "I can't say enough about Bryan," said longtime Senator Mike Fisher. "He was always so good to me and when it came time to move me he could have traded me anywhere, but he wanted (wife and country music star Carrie underwood) and I to be together and he was able to make a deal with David (Poile) to get me to Nashville. "That's just the kind of guy he was. He always thought about you as more than just a player. He wanted what was best for you as a person." In hearing that, I'd hope that more people would strive to be like Bryan Murray. There are far too many who worry about the bottom line or where the team is in the standings who lose perspective of everything that goes on outside of hockey. The fact that he did all he could to accommodate Mike Fisher's request to move to Nashville to be closer to his wife shows you that it's not always about winning and losing. Sometimes, it's about the people, and Bryan Murray never forgot that aspect whether he was making deals in the GM chair, handing out instructions as a coach, or simply providing sound advice to those that asked. The world lost a good man today. Rest in peace, Bryan Murray. You're a legend in this game called "life". Until next time, raise your sticks high in honour of Mr. Murray! You Know, Support The Team!